Is there a way to create sustained engagement in social communities while harnessing genuine motivation and striving for positive outcomes for all participants? Will purpose be the key to helping community members and hosts become better versions of themselves? Our collective social media experiences are becoming progressively more negative and toxic. Our social feeds are overflowing with tricks, hacks and best practices to “drive engagement." The best of these techniques tap into a member’s intrinsic motivation to trigger participation, the worst rely on psychological manipulation and negative emotional responses. If left unchecked, the negativity and toxicity are only going to get worse — especially if you consider that there are legitimate projections that most everyone on earth will be connected to “the network” by 2025. What if there was a way to create sustained engagement in communities and social experiences that harnessed genuine motivation and strove for positive outcomes for participants? I think the answer lies in focusing on the power of purpose to motivate community engagement and guide community activities towards positive outcomes — where community members and hosts collaboratively evolve towards better versions of themselves over time. As Community Architects (and Builders, Managers, Hosts, etc), we’ve always known that we needed to define a community’s purpose as part of strategic development, but we generally haven’t paid much attention to the role of purpose for individual community participants. Tactical goals in the context of a community experience? Yes. Thinking about the community member as a “whole person” with a life beyond your community? Let’s be honest — rarely. Our community experiences today are shaped by the limitations of the platform we choose to grow our communities on. Content (posts and messages) is typically the most dynamic element, followed by algorithmically-driven “streams." Reputation elements develop over time and are helpful when making judgements about the value of content and contributors, but it is hard to say that any given community experience truly evolves. "On the whole, the Online Community experiences today are surprisingly static." Next, think about what a community might look like if the host organization was actively refining and expressing its purpose through community interactions. In the book “Exponential Organizations,” Salim Ismail puts forward the idea of a “Massive Transformational Purpose,” or MTP, that describes the purpose of the organization to drive radical change or transformation within a specific context. 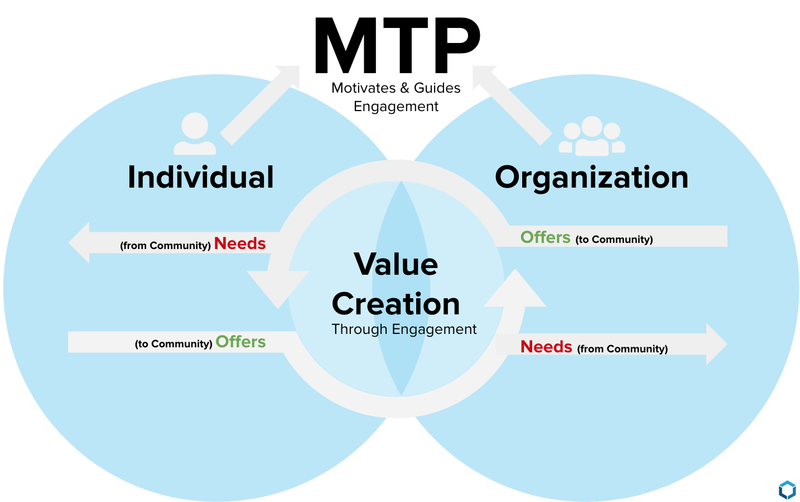 An Organization’s MTP attracts passionate advocates, helps align stakeholders and, motivates and guides activities towards fulfilling on the MTP’s intent. 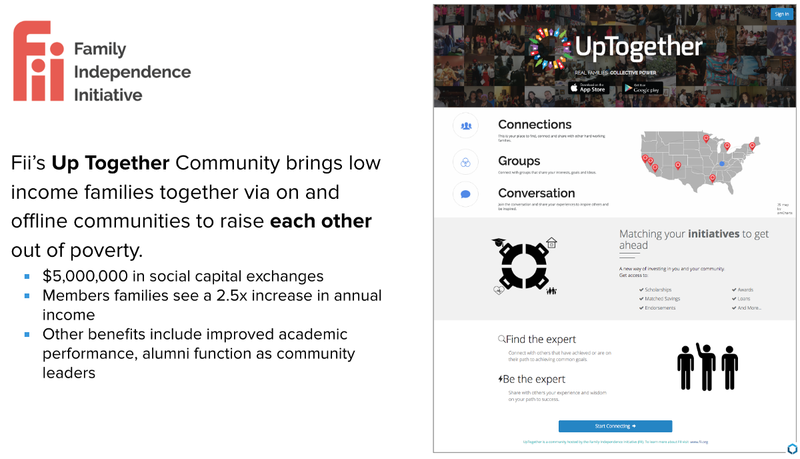 The relationship between community members and the host organization, when aligned towards actualization of a purpose, or MTP, can create incredible value and positive outcomes at scale. In November of 2015, I was honored to be chosen as part of the inaugural Rand Fellows with the Life Reimagined Institute. I was asked to be team leader and had the opportunity to work with Bryan Dik, Brooke Erol and Roberta Taylor. Our team was mentored by an amazing group of thought leaders, including Richard Leider, Alan Weber (co-founder of Fast Company) and Dr. Janet Taylor. The goal of my team was to create community-based programs that help people discover, refine and express their purpose. The goals of the eight-month pilot program is to study the best ways to help our community of participants discover, refine and express purpose through their work. Our team took the Life Reimagined process (shown in the graphic below) and mapped community activities to each stage to come up with the needed content and features for our pilot community program. We are in the early days of developing a model for Purpose-based Communities but we are already seeing impactful results from our studies. 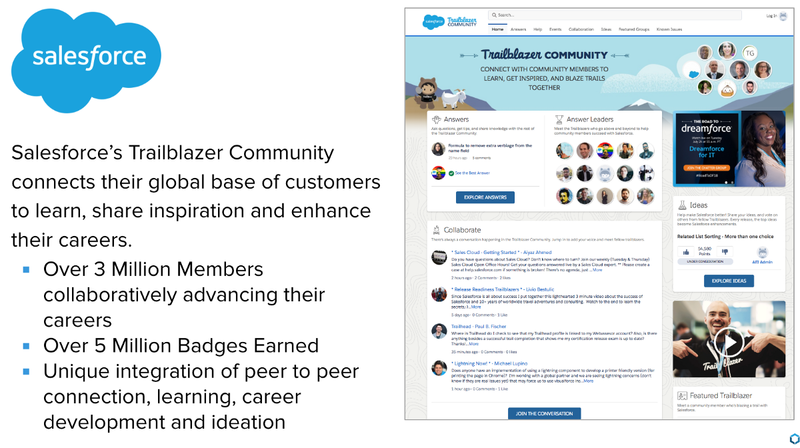 The Purpose-based model I’ve described is starting to emerge in the wild, and I would offer Salesforce’s Trailblazer / Trailhead and Fii’s Up Together communities as examples. 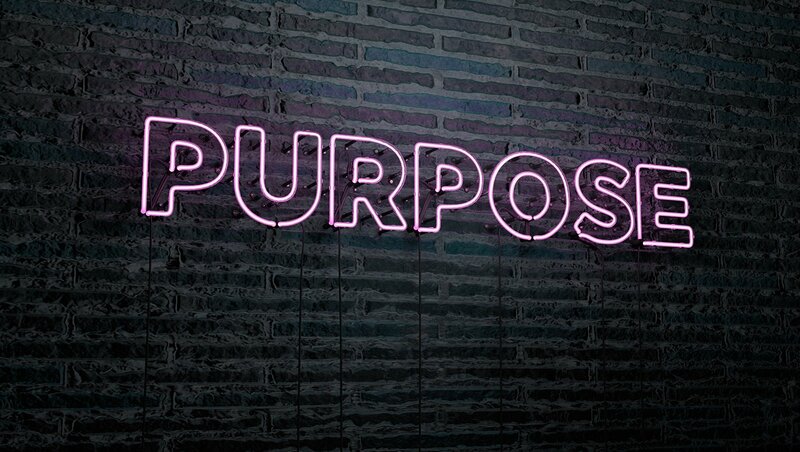 Once the language of Purpose is understood in a community, and once members and hosts can share their purpose (via statements / profile), the Community Managers / Hosts can play a critical role of connecting members with the content, people and activities they need to actualize the member’s purpose. The expression of an individual’s purpose is a large and complex topic. It is unlikely that any one community or organization can fully support the breadth of an individual’s need. Complimentary communities have an opportunity to partner around customer types and segments to offer experiences that support purpose. We will begin to see examples of Federated Communities as an alternative to mass social networks in the next 2–3 years. Powering these Community Federations with Purpose will be a positive and disruptive force. 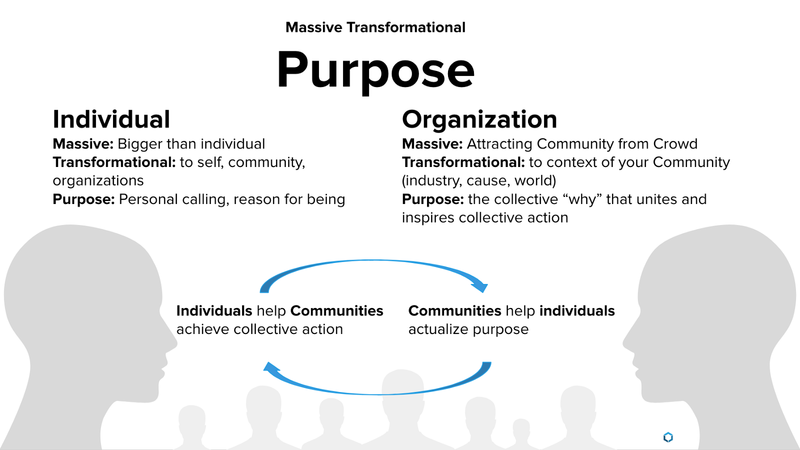 Creating a Transformational Purpose-based model for communities will be a breakthrough in performance, engagement and impact for many organizations. This new model will create the canvas for life-long relationships that are based on transformational and mutually beneficial outcomes for the host and member. Community platforms, programs and roles will need to evolve to realize the full value of the model. A version of this post was first published to Medium on May 9, 2016. A true advocate for "community, crowds, and collaboration," Bill Johnston has dedicated his career to the study, development, and evolution of in-person and online communities. 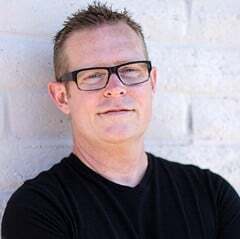 Currently, Bill is the President and Founder of Structure3C, which works to help "clients transform existing programs, launch new communities, and develop forward-looking strategies for community-based growth and innovation."